To many of us it seems like we are always running behind schedule or lacking enough Time. So what is Time really? And how can we control it instead of it controlling us? This month's newsletter is about Time. Below is a presentation of different types of Time. Perhaps by thinking about Time differently you will be able to create enough time in your life or completely function outside of Time and Space. It is said that Time is Money. But if there is no such thing as Time, as proposed below, where does that leave Money? Time is a dimension in which events can be ordered from the past through the present into the future. Time is also the measure of durations of events and the intervals between them. In the Greek language there are two different names for time. Chronos is numeric or chronological time, i.e. quantitative. Kairos is the metaphysical time of the right moment, i.e. qualitative. Linear time has a beginning and an end. Linear time splits everything up. Past and future is separated from present. Hours and minutes are divided up on the clock. Days, months, and years are divided up on the calendar. In the Abrahamic faiths based on the Bible (Judeo-Christian-Islam) time is linear, beginning with the act of creation by God and time will end with the end of the world. In Ecclesiastes of the Old Testament time was regarded as a medium for the passage of predestined events. Linear time is a convenient way to organize our lives while we are incarnated. We can separate events and organize them sequentially. We can track time on calendars and watches. Viewing time from this perspective we can always meet schedules and be on time for specific events. 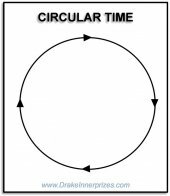 Another way to view time is circular. A circle represents the concept that all things are interrelated. With a circle, there is no beginning and no end. There is only that which continues to move in a cycle. Many ancient cultures (such as Incan, Mayan, Native American, Babylonians, and ancient Greeks) based their concept of time on a cyclical wheel. In Hinduism and Buddhism, the wheel of time is called the Kalachakra, which regards time as consisting of repeating ages. The round aspect of the circle makes it a natural symbol for the circle of life. Life mirrors the cycling of the seasons, the daily sun rising and setting, and the phases of the moon. Viewing time from this perspective puts us in rhythm with the earth. This rhythm is called the circadian cycle. The term circadian comes from the Latin circa, meaning "around" (or approximately), and diem or dies, meaning "day". Although circadian rhythms are internally inherent, they entrain to the local environment, especially to daylight. It also puts up in the rhythm of birth, death, and rebirth because everything moves around in cycles. And of course the most familiar object of circular time is the analog clock and wristwatch. Gregg Braden, in his book Fractal Time, demonstrates how the past is a blueprint for the future. Each event in history is self-replicating, becoming with each replication a more powerful, amplified version of itself. We can decode the future by identifying key events in the past and recognizing the pattern that projects the same events into the future. Braden combines the law of fractal patterns with the cycle of time to create fractal time. He has developed a formula that can be used to predict when history will repeat itself. The actual events of history may not repeat, but the conditions for those events to happen, definitely repeat. Our past repeats itself, carrying the same conditions of previous cycles, called fractal patterns, that can be measured and predicted. However, these cycles have choice points that allow a new outcome to be chosen. This is how our consciousness and free will can steer our destiny. Time repeats itself in cyclic patterns and each repetition is similar to the last with a greater intensity. It repeats in the patterns of fractals, which is how nature fills the space of the universe. 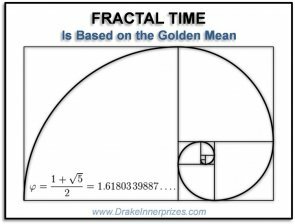 The golden ratio (1.618) is the number that determines how frequently nature repeats the fractals that fill space. 1.When can you expect something that has happened in the past to happen again? 2.What date in the past holds the conditions we can expect for the future? 3.When can you expect the conditions of a personal experience, either positive or negative, to repeat in our lives? Braden’s formula for time code calculation is: If you know (a) when the cycle begins, (b) when it ends, and (c) when the first event (seed event) that sets the pattern into motion within the cycle occurs, you can calculate the repeat points for the pattern that the event establishes for the portion of the cycle that remains. Go to www.greggbraden.com/calculator/ and the computer will automatically compute our information for you. Viewing time from this perspective allows us to see into the future and avoid mistakes of the past. Like time, which is a framework used in the 3rd dimension, space is also a 3rd dimension framework. Space is defined as the dimension that gives objects relative position and direction. 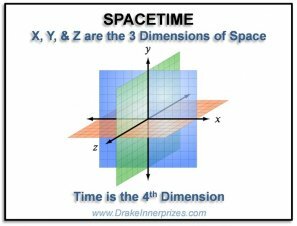 Spacetime is the combination of space (3 dimensions) with time (the 4th dimension) into one continuum. Time (as you will read in the next section) is a vibration of energy and space is a dimension of motion. Both time and space are synchronized and vibrate in harmony. Einstein merged time with space in his theories of relativity. He said that the concept of time depends on the spatial reference frame of the observer. In addition, the perception and measurement by instruments varies for observers in relative motion. Einstein’s formula for spacetime is: "Two events taking place at the points A and B of a system K are simultaneous if they appear at the same instant when observed from the middle point, M, of the interval AB. Time is then defined as the ensemble of the indications of similar clocks, at rest relatively to K, which register the same simultaneously." Viewing time from this perspective allows us to realize that time is not concrete but fluid based on the point of view and motion of the observer. This becomes the natural segway into the next definition of time, time frequencies. 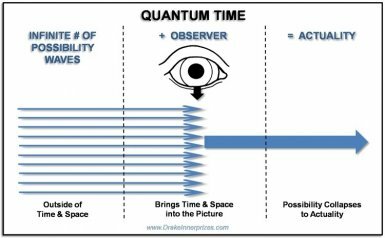 Timespace is the opposite dimension from spacetime. In timespace you are fixed in space but can move all throughout time quite easily. In spacetime, which we are now a part of, you are fixed in time but can move around quite easily in space. It is through visiting timespace that a complete view of a soul’s entire range of experiences, past, present, and future, can be seen. Timespace is the dimension that we go after we die to review the lessons that we learned in our lifetimes. It is also a dimension that can be visited by psychic vision. Past, present, and future are labels we attach to vibrations of energy to help us differentiate our experiences. The past vibrates at a slower energy than the present and the future vibrates at a faster energy than the present. In order to consciously access these other dimensions, we would need to “tune” our awareness in just like tuning into a specific radio station. 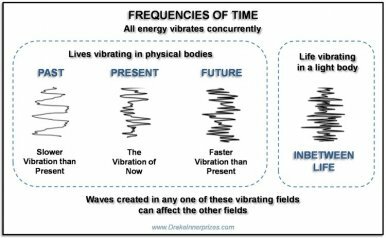 All of these energies are vibrating concurrently so technically you are living all of your lives, past, present, and future concurrently. Karma is the energetic wave that can affect all lives simultaneously. Your physical body is limited to the present space and time. However, your soul is composed of energy and is not limited to any particular dimension. Awareness exists in spiritual form not physical form so thoughts, feelings, and actions are also composed of energy and can transcend time barriers. Everything we think, do, and feel in the present has repercussions and reactions in the past and the future. As we think, feel, and act in the present, we influence all the interrelated vibrations of time. Whatever we change will correspondingly change all the events connected with that experience in the past, the present, and the future simultaneously. What does this mean? We can change the past and future from the present because they are all happening simultaneously. If we open up our spiritual awareness we can see how we have the power to create our present and future with more enlightenment. This will set off a chain reaction that can positively influence the past as well. Richard Bartlett, in his book Matrix Energetics, says that time can be envisioned as a hologram allowing us to change the parameters of past events by the way that we remember them. Quantum theory says that at every moment there are multiple possible outcomes. Super string theory says that the basic component of the Universe is made of vibrating loops of string. In order for this theory to work mathematically, our universe must have at the least 8 to 12 dimensions. Thus it is possible for parallel dimensions to exist simultaneously. Parallel worlds theory combines quantum and string theory to say that for any activity there are an infinite number of choices that spring up and every single possibility must spring into existence in a parallel world. Bartlett calls these Parallel Dimensional Expressions (PDEs). Knowing that time is energetic and not linear also means that there is no such thing as an old soul. Souls can be differentiated only by how dense their experiences, awareness, and knowledge is. Eckhart Tolle, Buddhists, and other proponents of meditation pronounce “be here now”. “Be present.” Would that not be much easier to do knowing that the past and future are all happening concurrently and that by focusing on the present, the past and future are accounted for also? That if we focus on a future or past thought it really is the same time period as the present? Viewing time from this perspective allows us to see how past, present, and future lives really don’t exist however there can be a number of parallel lives happening concurrently. In addition, energy that is released through thoughts, emotions, and actions in any one of these lives, can affect any number of other parallel lives. Mircea Eliade, author of Shamanism, says that a shaman is one who makes a journey in an altered state of consciousness outside of time and space. Since shamans are the walkers between the worlds, they have the capability to transcend time and space at will. How is this possible? One, shamans understand the energies of the universe. They know that everything is energy and that everything is connected through energy. They also are experienced in traveling to alternate realities, either through the shamanic journey and/or by partaking of mind-altering plants. 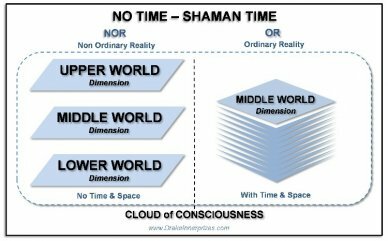 The shamanic journey is a method of entering into an altered state of consciousness, also called Non-ordinary Reality (NOR). NOR is inhabited by helping spirits and is composed of 3 layers: the lower world, the middle world, and the upper world. 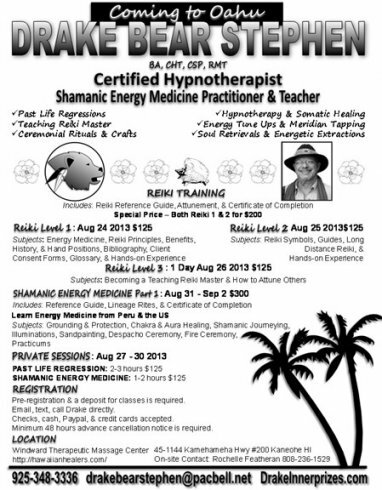 Shamans establish relationships with these spirits and bring back healing information for the community or individuals. Traditionally, shamans have been the bridge between two types of time: 1) Material Time, which is being the keepers of the community calendar and the guardians of seasonal cycles and 2) Essential Time, which is time as it exists in other worlds. A good way to experience time in an altered state is to be hypnotized. After returning from the altered state of hypnosis, you notice immediately that the time lapsed in Ordinary Reality (OR) is much different than the time that elapsed in NOR. Viewing time from this perspective allows us to see that NOR can be viewed as parallel dimensions and NOR exists outside of time and space. Shamans, then, travel the energetic connections between the dimensions.As you will read in the next section, these energetic pathways are consciousness. Amit Goswami, in his book Physics of the Soul, says that it is an observer’s looking that creates a unique actuality from the possibility waves, that is, conscious looking manifests an actual event from all the possible ones. Waves of possibility have to travel outside of space and time because if they didn’t, they could not collapse instantly into actuality. It is consciousness that collapses a possibility wave into actuality. Amit Goswami goes on to explain that once two quantum objects are correlated via interaction, the correlation remains even if the objects are separated by vast distances and are not connected via signals through space and time. They have to be connected through nonlocal consciousness that transcends time and space. Viewing time from this perspective allows us to see that time can only exist when we are conscious of it. It is our consciousness that creates time. Try it as an experiment some time when you are running late. Say until you believe this statement “I am moving outside of time and space.” You may actually arrive to your destination on time even when you knew it was not “physically” possible according to clocks as we know them. 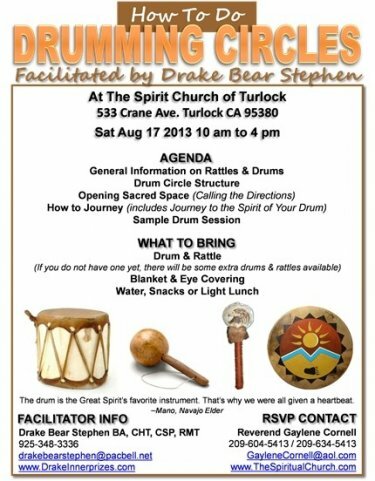 I am offering a Drumming Circle class at the Spirit Church of Turlock on Sat Aug 17. Pre-registration is required. Go through Gaylene Cornell. This class is filling up fast! Agenda covers smudging, general information about drums and rattles, drum circle structure, opening sacred space, and how to journey to the spirit of your drum. Pre-registration is required so sign up now! Mahalo Rochelle Featheran and LaBryanna Kubo for hosting me. Aloha! 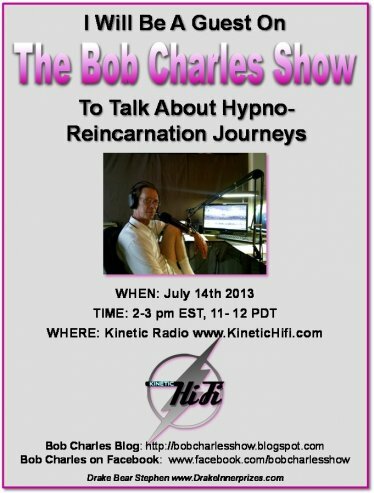 If you missed my gig on the Bob Charles Show on Kinetic Radio, you can listen to a recording of it in the archive. The actual program starts about 2.5 to 3 minutes in. The end was cut off.